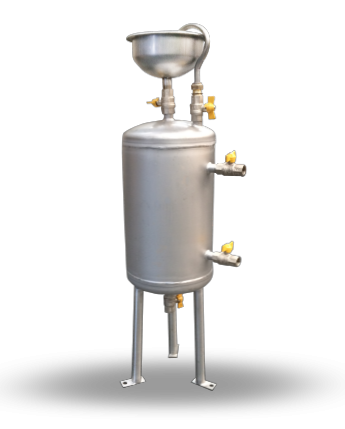 Wilson manufactured chemical dosing pots are designed extensively for in-line plumbing installations for a safe and controlled method of dosing sealed heating and chilled water systems mostly by HVAC & mechanical services. Designed to A.S 1210 Pressure Vessel code Class 3. Standard models are free standing, floor mounted design rated to 850 k.p.a working pressure though other pressure settings are available. Utilising a funnel & valve arrangement to enable: – isolation, draining & re-dosing of the circuit. Wilson dosing pots are used for chemical dosing of sealed heating and chilled water systems with chemical additives to avoid corrosion of pipes and components. Wilson dosing pots are manufactured from 304 grade stainless steel and range in size from 7 litres thru to 45 litres.